Crypto security tokens will be a hot topic in 2019. The tokenization of securities will make trading shares more efficicent and cost effective, removing obsolete middlemen from the process. Security tokens are similar to shares of stock in a company. They can yield dividends, provide revenue share, or appreciate in price. Overstock’s Medici Ventures launched tZero, a security token trading platform in the Summer of 2018. This could be a game changer for the crypto market and financial markets at large. In addition, Fidelity is getting into digital assets and smaller startups are launching services to tokenize various securities. Institutional interest has never been stronger and will continue to grow. The asset class is maturing although some regulatory hurdles still remain. Are Crypto Security Tokens Really Securities? With the rise of initial coin offerings (ICOs) has come an important question: are tokens issued in an ICO considered securities? If they are, they become subject to a long list of regulatory requirements. The Securities Exchange Commission (SEC) has decided that some ICO tokens can be classified as securities. But the criteria for deciding this is about as vague as it gets. There’s a simple solution to this problem, however. Why not just create tokens that are intended to be securities in the first place? That is one thing that Overstock’s TZERO platform intends to do. The platform can be used to conduct ICOs in a way that would be registered with the SEC, eliminating the existing confusion. “Published Thursday by the U.S. Patent and Trademark Office, the patent describes a “Crypto Integration Platform” capable of combining market information from a variety of sources to determine best prices. The system would then “secure both the digital transactional items (i.e., the funds for a buy order and the digital assets or liabilities for a sell order)” before conducting the transaction.These transactional items could include digital assets, liabilities, commodities, cryptocurrencies, tokens or cash. This integration will make it much easier for capital to flow between asset classes. Using an honest price discovery mechanism in a regulated environment, traders will be able to exchange assets in a way that has never before been possible. And Overstock’s CEO is making a massive bet on platforms like this being the future of financial markets. Next month, Overstock will sell its retail business to go all-in on crypto. What impact will this event have on its share price? Fluctuating between $13 and $15, shares of Overstock (OSTK) are trading near multi-year lows to start off 2019. On the one hand, this could be a good buying opportunity for speculators. On the other, long-term investors might want to wait for more information before making any large moves. To be fair, $2 million is a fraction of a percent of Overstock’s average quarterly revenue in recent years, which has ranged between $400 million and $500 million. But it’s still a loss. And until it turns a profit, owning tZero is making a speculative bet that the platform has a future. And if tZero has a future, then security tokens in general probably do too. Of course, I believe they do. But things can change fast, as everyone in the crypto community knows. A single harsh decision by regulators or a bug in software, for example, could create an insecure environment for crypto security tokens. Unlikely, but possible. Medici Ventures: Mistake or Genius? CEO Patrick Byrne could either end up being a revolutionary genius or his dream for tZero will fail. The decision to buy, hold, or sell Overstock at this point is purely speculative based on too many pieces of unknown information. He also notes that the price of OSTK is highly correlated with the price of BTC. Therefore, the stock’s price needs a corrective rally in crypto in order to see another uptick, according to this line of thought. Overstock is planning to sell the retail side of the business within the next month or two. Estimates are that it is worth around $200 million. The company has around $180 million in cash on hand and $156 million in current liabilities, for $24 million in net working capital at the end of last quarter. With a market capitalization of $461 million, this values Medici at $236 million. Overstock invested $175 million into the venture, with $125 million going into tZero. But private equity firm GSR Capital agreed to acquire 18% of tZero for $270 million implying a post-money valuation of $1.5 billion. GSB Capital has sought an extenstion of the timeline to make that investment and probably realized that the valuation was too high. But still, even if tZero is worth just one third of the GSR Capital valuation or around 3x Overstock’s investment, this still implies a much higher valuation for shares of Overstock. It is an intersting investment, particularly if the blockchain space continues advancing and prices start rising again. Another way to get exposure to tZero is by purchasing their tokens on an exchange. 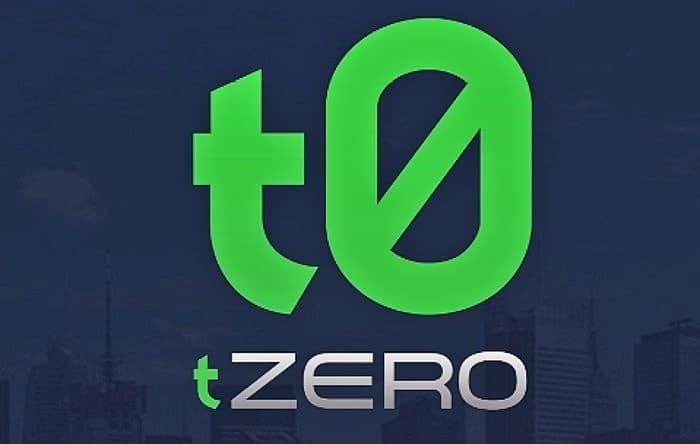 tZERO was launched by Overstock in the summer of 2018. The exchange announced back in October 2018 that it would close its security token offering, after it had raised $134 million. According to reports on local Chinese news outlet BlockTempo, tZERO has begun distributing control of its security tokens as of January 16th, 2019. There’s more reason to be optimistic, however. There are also other security token projects that might be even more revolutionary than tZero. But keep in mind that significant competition means that the valuation of tZero and OSTK may struggle if competitors do well. But the beauty of blockchain is that it allows free and open competition. Enter Polymath and DX Exchange. One such security token project is Polymath. According to its website, “Polymath eliminates the middleman and financial structures that hinder the deployment of equity.” With Polymath, it’s possible for companies to create their own security tokens. DX Exchange is “built on NASDAQ’s market leading matching technology.” Like other institutional investment platforms, DM Exchange provides a way for individuals and institutions to exchange fiat and crypto. The exchange has top-notch cybersecurity and a team of over 70 R&D engineers. Platforms like these will facilitate additional activity into crypto security tokens. So, what exactly is a crypto security token? There are two main types of tokens: utility tokens and security tokens. Most tokens today are utility tokens, like the Brave browser’s Basic Attention Token, for example. As the name implies, utility tokens serve a specific function and are intended to be used for that function only. Security tokens are more like, well…securities. “These tokens constitute an investment contract, where the main use-case, and the reason for the contributors to buy the tokens, is the anticipation of future profits in form of dividends, revenue share or (most commonly) price appreciation. Security tokens in and of themselves are creating increased interest in crypto. And even all that aside, some big players are getting ready to make big moves into cryptocurrency. While cryptocurrency prices declined throughout most of 2018, institutional investors have never been more interested in this asset class (despite what some sources say to the contrary). This is evidenced in the creation of services like Baakt, and more recently, Fidelity Digital Asset Services. Fidelity Investments manages over $7.2 trillion in assets. Fidelity is the first Wall Street company to offer cryptocurrency services. Fidelity Digital Asset Services will manage cryptocurrency trade execution and custody for institutional investors. This will make it much easier for hedge funds, family offices, endowments, and other investment services to acquire cryptocurrencies like BTC and ETH. This is likely to result in increased capital inflows into the crypto space in the months to come. Some market observers believe that when institutional capital does flow into crypto, it will trickle down to retail investors as well. This could happen as a result of the new asset class becoming more legitimized in the eyes of both the general public and regulatory authorities. It’s generally agreed upon that the next wave of crypto adoption (and price appreciation) will come about as a result of institutional investment and regulatory guidance. The seeds of this happening are already being sewn. There are many more large institutions preparing to enter the crypto space – too many to list here. Crypto Security Tokens & OSTK: Time to Buy? In short, as far as speculative positions go, security tokens are probably the best bet around right now. But I consider them to be more speculative than holding BTC because of how new they are. Patrick Byrne’s exuberance about TZERO being crypto “cold fusion” is a little extreme. But he does have plans to change the digital asset market, and given his track record, he’s likely to create something worthwhile. It might qualify as fission or even hot fusion, but cold fusion, really? One thing is for sure: platforms like TZERO, Polymath, DX Exchange and Fidelity Digital Asset Services will change the crypto space in a huge way in 2019. We publish a monthly cryptocurrency letter for subscribers. It covers our top picks in cryptocurrencies and blockchain-related stocks. Sign up here. Disclosure: the author does not hold tZero or OSTK at the time of writing.